The Yuba Goldfields in California’s Central Valley is one of the more bizarre and intriguing landscapes in the state — a swath of moonscape, wetlands, and sagebrush that stretches along both sides of the Yuba River. Huge piles of rock tailings, left by gold dredgers in the early part of the last century, loom over ponds filled with bass and trout and frequented by migrating waterfowl. This lonely landscape, about 15 miles from Marysville, has only four houses and very few roads. But life here hasn’t always been peaceful: In 1971, a large Texas-based conglomerate, Centex, attracted by the Goldfields’ immense reserves of gravel, began purchasing land in the region. By 1987, it had acquired 2,600 acres, more than a quarter of the Goldfields. Gravel is much in demand for roads and the concrete needed for development. That same year, Centex’s subsidiary, Western Aggregates, declared ownership of a long-used Goldfields road, closing it off and locking the gates at both ends. The move shut off access to some 5,000 acres of public land long popular with local fishermen, hunters, and kids looking for swimming holes. It also meant that a retired garage-door-opener salesman named Bill Calvert had a hard time getting to and from his ranch in the Goldfields. The company gave him a key to one of the gates, but the lock was sometimes jammed and inoperable. Someone other than Calvert might have sold the ranch and moved to a less contentious setting. But not Calvert, who’s now 70, and is described by those who know him as extremely stubborn, and — at times — "ferocious." Taking on Western Aggregates meant confronting its deep-pocketed parent company. "There was no way I could fight them on my own. I knew I was going to need a lot of help," Calvert says. He used his salesman’s charm to cobble together the Yuba Goldfields Access Coalition, an alliance that included a sport-hunting group and a watershed organization based in Nevada City, about 30 miles from the Goldfields. The group set to work researching the region’s complicated land ownership, but it also employed less subtle tactics. 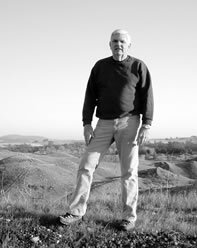 Huey Johnson, a former California secretary of Resources and an early member of the coalition, remembers the evening that Calvert, hearing that one of Johnson’s friends had been stopped by a locked gate, stormed out of his house, hopped on his tractor, and yanked the gate open with a chain. At other times, Calvert used bolt cutters to get the gates open. "The man is a tiger," Johnson says. But what Calvert’s friends saw as acts of heroism, the mining company considered blatant vandalism and trespassing. Calvert can’t remember exactly how many times he was arrested — he thinks maybe six — and he estimates that there were a total of 50 arrests among the Goldfields public-access advocates. The Goldfields coalition was not part of the Sagebrush Rebellion, like the Jarbidge Shovel Brigade, which tried to open a road into a national forest in Nevada despite the risk to endangered bull trout, or Utah’s bulldozer-driving county commissioners, who want to disqualify land from wilderness protection. There was no ulterior motive, members say: Simply a desire to get to public and private lands the way locals had done for years. As the coalition persisted — and the arrests multiplied — the mining company ultimately became so frustrated that it sought a formal court ruling to declare the main access road, known locally as Hammonton Road, private. Yuba County – with funding and encouragement from the Yuba Goldfields Access Coalition — agreed to fight the company’s claim in court. In 2002, a state appellate court settled the issue by declaring that Hammonton Road was indeed a public road. By that fall, the gates into the Goldfields had been permanently unlocked. Calvert’s work has opened the way for a whole new future for the Goldfields. Deane Swickard, manager of the Bureau of Land Management’s local field office and an avid outdoorsman, has begun implementing his own sweeping vision for the 4,600 acres of public land in the area. Swickard hopes to stitch the patchwork of public land into a recreation area. He envisions a parkway with hiking and bicycling trails, as well as channels for canoes between the ponds. It will, he hopes, attract visitors from around Northern and Central California. Calvert likes the idea. Last spring, he helped a BLM crew spread clay and gravel over a five-mile stretch of the potholed access road. Once the road is made more passable, Swickard wants to bring in a mining company to haul out piles of gravel from a 500-acre patch of BLM land. In exchange for the gravel, the agency will require the company to do some of the initial landscaping for the Goldfields’ first public trails and canoe routes. None of this would be possible without Bill Calvert, says Swickard: "He’s the most stubborn man I know. He stuck to his guns when everyone, including myself, the U.S. attorney and the county counsel, were saying that was a private road out there. As it turned out, he was right, and everyone else was wrong." Calvert is ready to start enjoying the pastoral life he’s been yearning for since he and his wife, Freda, moved to the Goldfields 30 years ago. He’s spending more time with his grandchildren, and he’s finally found the time to raise calves and plant a big garden. The bolt cutters, he’s happy to note, are in a corner of his toolshed, gathering dust. The author lives in the Mount Shasta region of Northern California.